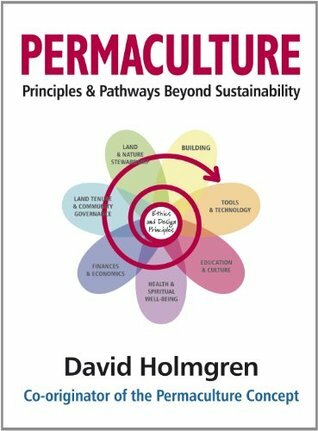 There is so much in David Holmgren’s Permaculture that I am sure I will return to it, but I wanted to capture the basics in one post. One long post. Way back when I had a house and a garden, I found out about permaculture and read the huge manual by Bill Mollison and was immensely impressed and tried to grow all my own veg. I failed, and learned a lot in the process. It is many years on now, of living in rooms and flats and no access to gardens and moving and a publishing endeavour and a thesis. I am quite excited to come back to it in thinking about urban and public space and how we live, how we create community, how we leave every place we inhabit, and the earth itself, better than we found it. That’s rarely talked about. Uncertainty about our place and our future and our knowledge, however, is more and more talked about. 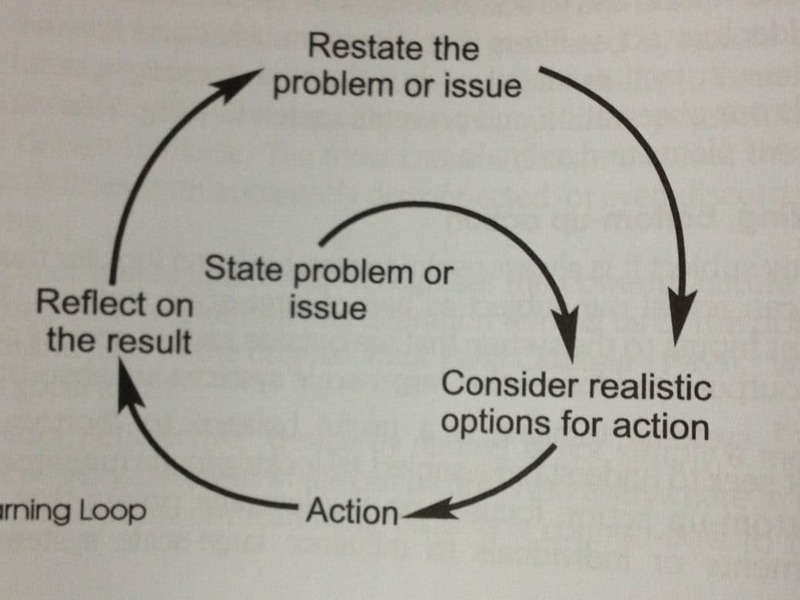 I am trying to think more along continuums rather than through binaries, but this is useful I think. Definition: Expanded from Permaculture One: “Consciously designed landscapes which mimic the patterns and relationships found in nature, while yielding an abundance of food, fibre and energy for porvision of local needs.” People, their buildings and the ways they organise themselves are central to permaculture. Thus the permaculture vision of permanent (sustainable) agriculture has evolved to one of permanent (sustainable) culture. Yes please, let’s do that. I wish everyone from now on could just start right here. It is part of care for the earth: understanding the living soil, stewardship of land, preserving biodiversity, seeing all living things as intrinsically valuable and minimising our impact on them. Care for people? It means understanding the massive structural inequalities, doing what we can to undermine them beginning with ourselves and our families, our neighbourhoods, our communities. I think missing here is a little deeper thought into social and racial justice and how those intersect with environmental justice — the words environmental justice don’t appear at all, but I think will have to be intrinsic to a wider movement. Graham Haughton‘s work is a start among that of many others I am now exploring. And hell yes to redistributing surplus. The icon of sunshine captured in a bottle suggests the preserving of seasonal surplus and a myriad of other traditional and novel ways to catch and store energy. It also reflects the basic lesson of biological science: that all life is directly or indirectly dependent on the solar energy captured by green plants. Energy is stored in landscapes — water, nutrients and carbon. This is what our presence should be working to rebuild. This means we think about the land we can manage, we think about catchment and regional planning, and we think about households and the built environment as stores of energy. Then he goes on to talk about Kropotkin‘s refutation of the Darwinists in arguing that cooperation is as prevalent if not more than competition. Yay. It means understanding where and how we are dependent on social relationships — harder to see sometimes in the modern world, just as our interdependence with the other creatures in our world is obscured. In modern society, we take for granted an enormous degree of dependence on large-scale, often remote, systems for provision of our needs, while expecting a huge degree of freedom in what we do without external control. In a sense, our whole society is like a teenager who wants to have it all, have it now, without consequences. This is really hard, because it’s been a really long time since we’ve done it. That’s all about to change. A critique of privatisation, of built-in obsolescence. A recognition that the world’s poor know more about this than anyone else living, and instead of being looked down upon they should be held up as teachers and examples. I don’t think it surprises me that he references Christopher Alexander’s Pattern Language here, looking at the regular patterns to be found in our built environment. 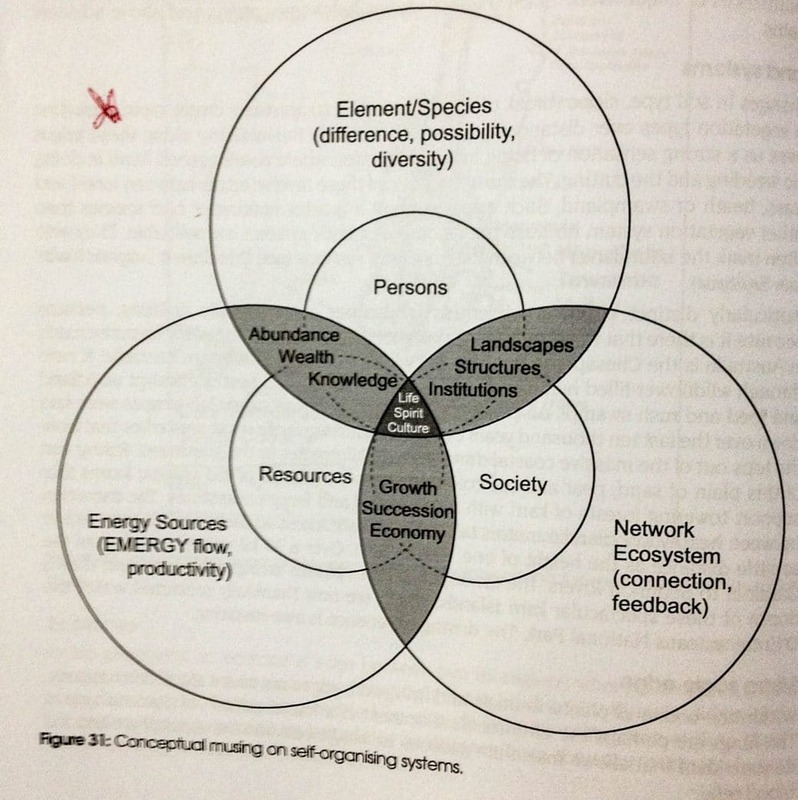 I quite love that he tries here to look towards beginning a similar pattern language for permaculture design. This is all about thinking how energy is stored in the landscapes we create, but its interesting to think of ‘site design as cellular design’. We can think of a permaculture-designed garden (Zones 1 and 2) as a human rural settlement cell. There is a limit to efficient garden size before we have to jump up into a more complex production system. Successful gardens do not keep expanding. Instead, they provide a surplus of plant stock and human knowledge that help to establish new gardens. Our cultural bias toward focus on the complexity of details tends to ignore the complexity of relationships. We tend to opt for segregation of elements as a default design strategy for reducing relationship complexity. There’s a section called rebuilding community, and god knows we need that. Lovely — though the use of the word lubricated still makes me giggle like a twelve year old. I also love how clearly this stands in opposition to Le Corbusier’s paean to speed adhered to by planner after planner. The spinebill and the humming bird both have long beaks and the capacity to hover, perfect for sipping nectar from long, narrow flowers…. It’s also interesting that emerging from nature, this value of diversity is connected to place and it is the cultures most attuned to the places where they live that hold the most wisdom. This is particularly interesting in thinking about cities, the new cultures of place that grow in them, and how their connections to the land surrounding them can be made visible and healthy. I like that he looks at ‘marginal’ neighbourhoods, cites Jane Jacobs as noting that they are where space and low rent allow new things to grow and thrive. Also the ways that we see the edges between rural and urban, where it is the connections that are interesting. I find all of these useful starting points for thinking about cities, planning, building communities. It is built for praxis, and while much of this book is highly detailed about how these have been concretely implemented in terms of household design and agriculture, I think it will be quite fruitful to explore how they can be usefully applied in a broader movement to help create a better world. All of these things fit together, and I am enjoying exploring the potential of this.